The Engine 27 is specially designed with metallic radial fins to accelerate the thermal transfer process. Especially, the radial arrangement with 119 fin design can minimize the gap between the fan and the fins, thus, hot air can be exhausted more rapidly and efficiently. *Due to Engine 27 is using 8-pole motor, the RPM read by Bios is twice of the real RPM. 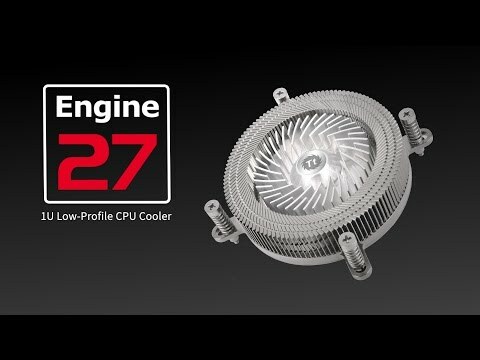 The Engine 27 perfectly solves the co-existing problem of high performance RAM and CPU coolers, achieving the best RAM clearance. Thermaltake Engine 27 Low-Profile 1U Intel CPU Cooler, 27mm Height, PWM, Metallic 60mm Fan, Aluminium/Copper Base is rated 5.0 out of 5 by 1. Although I am not planning on a huge overclocking, I would like to know wether this will be appropriate to keep the cpu cool under stressful workloads. Thanks.